(Nanowerk News) On 22 April 2015, it is world Earth Day. The idea is to raise awareness of the need to rely on renewable energy. The EU requires its member states to provide a a 27% share of renewable energies by 2030—up from a 23.3% share of the overall electricity generated in Europe in 2012. Thus, wind power is on the rise. But its success depends on European countries’ renewable energy policies, which have a knock on effect on raising electricity bills. There are various reasons why some countries prioritise wind power. “Of course, there needs to be wind,” says Poul Erik Morthorst, head of the management engineering division at the Technical University of Denmark, in Roskilde. Moreover, “When it all began, there was strong local interest for wind power in some countries,” particularly in Denmark, Spain or Germany, he adds. 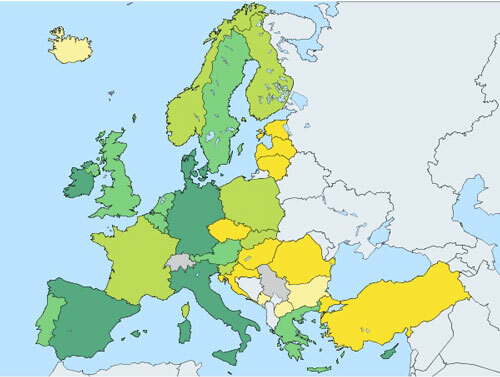 Installed wind energy capacity in EU member states as percentage of EU total. Meanwhile, there was political will to financially support these activities. 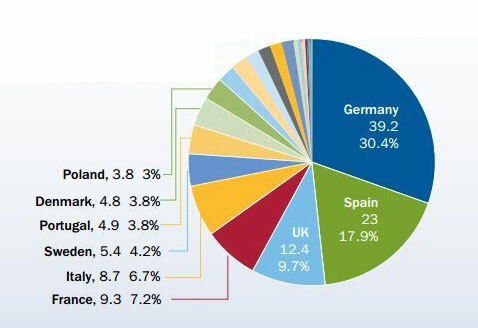 Germany and Spain have thus the largest installed wind energy capacity in Europe. This creates a divide in Europe between countries who have a wind power policy and those which don’t. In turn, a country’s renewable energy policy has an impact on people’s electricity bill. As a result, consumers in Denmark, Germany and Spain pay the highest electricity prices in Europe. In Denmark, “a large part of the retail prices is tax”, says Morthorst. “Wind power has not yet reached grid parity everywhere. In these cases, it is still more costly than fossil fuel based power,” says Barbara Breitschopf, expert for energy policy at the Fraunhofer Institute for Systems and Innovation Research in Karlsruhe, Germany. Moreover, the renewable energy surcharges added to consumers’ bills to support subsidies provided to developers of green energy, increase the electricity price for final consumers, Breitschopf explains. Yet, when there is a lot of wind power this may measurably reduce the electricity price at the stock market. But in Germany, for example, “This price decreasing effect does by far not compensate the increase of electricity prices from the surcharge,” she adds. An expert agrees. “Customers do not feel the benefits of declining wholesale prices because they are wiped out by increasing taxes and policy support costs,” says Giuseppe Lorubio, head of the unit retail customers at the union of the electricity industry in Europe Eurelectric, in Brussels, Belgium. He believes, as renewable support rises, policy support costs will likely exceed taxes in some countries soon and, therefore, calls for “market based and cost effective” support schemes. While acknowledging that support for wind energy should be “market compatible”, Morthorst stresses that such advantages including no local pollution, no CO2 emissions and the security of supply are usually “not calculated into the price”. Overall, “The benefits of wind power are larger than the drawbacks,” he concludes.